MOFFETT FIELD, Calif. -- NASA’s Ames Research Center, in conjunction with NASA’s Office of the Chief Technologist’s Emerging Space Office, is continuing its support for the Space Frontier Foundation’s annual Business Plan Competition by funding this year’s awards totaling $110,000. The Space Frontier Foundation Business Plan Competition will be held during a three-day event at NASA Ames in July 2012. The NASA supported Emerging Space Grand Prize will include an award of $100,000 for the best business plan with the potential to contribute to space development. NASA also is supporting a second prize of $10,000. The Business Plan Competition is designed for new, independent companies in the seed, start-up, or early growth stages. The competition simulates the real-world process of entrepreneurs soliciting for start-up funds from early stage investors and venture capital firms. The competition traditionally includes a review of business plan submissions by space industry experts and investors and a ‘Boot Camp’ where the finalist teams will receive expert training in promoting and developing business plans. In order to be eligible, competing companies should have technologies or products that potentially could contribute to the expansion of economic activity in space. Competition finalists will pitch their business plans publicly and be judged by a panel of world-class entrepreneurs, venture capitalists and finance professionals. The Space Frontier Foundation is an organization dedicated to opening the space frontier to human settlement as rapidly as possible. Its goals include protecting Earth's fragile biosphere, creating a freer and more prosperous life for each generation by using the unlimited energy and material resources of space, and unleashing the power of free enterprise to establish a permanent human presence in space. For more information about NASA's Office of the Chief Technologist, visit http://www.nasa.gov/oct. For more information about the Space Frontier Foundation Business Plan Competition and how to participate, visit http://newspacebpc.com. For more information about Space Frontier Foundation, visit http://spacefrontier.org. For more information about Ames, visit http://www.nasa.gov/ames. PANAMA CITY, Fla. (NNS) -- For offering a clearer vision for U.S. Navy divers, a Naval Surface Warfare Center Panama City Division (NSWC PCD) employee was named the Federal Laboratory Consortium (FLC) 2012 Excellence in Technology Transfer award recipient, Jan. 23. Dennis Gallagher, lead project engineer and inventor of the Advanced Diver's Mask-Mounted Display System in the NSWC PCD Underwater Systems Development and Acquisition branch, earned the award for his work on the Advanced Diver's Mask-Mounted Display System. The display system was made available for commercial and military use in December 2011. NSWCPCD initiated a technology partnership with Sound Metrics Corporation through a Cooperative Research and Development Agreement (CRADA) agreement, and partially exclusive licensing agreement between NSWC PCD and Sound Metrics Corporation, based in Lake Forest Park, Wash.
Gallagher initiated the system's patent for which the government now owns. After the system was patented, the CRADA was reached then a license agreement and then the technology transitioned to production manufacturing. Gallagher said the original idea for this mounted display system came from simply listening to the customer. "The original idea for the diver mask mounted display came many years ago from a test with several underwater sonars and a very rudimentary underwater display monocle that was being used," Gallagher said. "After a test dive with the sonar and monocle, we were reviewing the sonar images the diver had recorded during the dive. When looking at the images on the computer the diver remarked, 'Man, if I could have seen the images with this resolution down underwater, I would have known what the items were.' That's when I knew we had to develop an underwater diver display equal in quality, color, and resolution to a computer laptop screen. It wasn't an easy task, but we did it." NSWC PCD and FLC representative Edward Linsenmeyer and Underwater Systems Development and Acquisition Branch Head Karen Borel both agree that Gallagher's work to successfully transition the mask to Sound Metrics, who is now manufacturing the Navy design as a commercial product and is available to military and civilian divers, is nothing short of transformational. Linsenmeyer endorsed Borel's nomination of Gallagher for the 2012 FLC award. "Until now, divers working in dark, murky waters haven't been able to effectively survey and assess their surroundings, but with the Advanced Diver's Mask-Mounted Display System, it's a new underwater world," Borel said. "The transformational flip-up, flip-down device is like an "underwater night vision" system that allows divers to see what they're doing; whether they're looking for mines, scanning for intruders, inspecting ship hulls, recovering a body, searching for evidence, or studying fish behavior." Gallagher, a native of Phoenixville, Pa. who also calls Tallahassee, Fla., home, joined NSWC PCD after he graduated in 1984 from Florida Atlantic University with a bachelor's degree in mechanical engineering. A diver himself, Gallagher brought his technical expertise and experience to conceptualize, deliver, and ultimately manage the successful transition of a mask's mounted system able to withstand depths of 300 feet, and quickly transition it for use. "The 800 x 600 super video graphics array (SVGA) screen incorporates organic light-emitting diode (OLED) displays that are color-balanced and contrast-matched, giving the diver an astonishingly clear and actionable view," Borel said. "The mask-mounted display system is a whole new ballgame when compared to anything previously available, offering higher contrast, brighter color, smaller size, lighter weight, larger eye relief, lower cost, and lower power consumption. In addition, a low-magnetic version will be available for use by Navy Explosive Ordnance Disposal divers." Federal technology transfers are the movements of technology, knowledge, facilities, or capabilities from one sector to another to promote and strengthen technology transfer nationwide. That transfer may occur between government entities or government and private sector. The results of these technology transfers can result in commercialization of new products in commerce, and perhaps even enhance laboratories or agency mission objectives. "This technology transfer achieves the "grand slam" of technology transfers, also known as T2. U.S. Navy technology is embedded in a new commercial product, which has both military and non-military application, and the Navy can turn around and purchase that manufactured good economically," said Linsenmeyer. "Thanks to Gallagher's innovative thinking and perseverance, and the NSWCPCD team, the Advanced Diver's Mask-Mounted Display System has literally changed the outlook for divers-and for military mission readiness. With this groundbreaking technology, the future looks clear." The FLC was organized in 1974 and Congress passed the Federal Technology Transfer Act in 1986, which officially chartered the FLCs. Today, the FLC is comprised of technology transfer professionals from more than 300 federal laboratories, their respective agencies, and affiliated organizations. Several mechanisms exist in which government technology may transfer to another sector, such as Cooperative Research and Development Agreements, or CRADAs, collegiate interchanges, or technical assists. Gallagher will accept the 2012 Federal Laboratory Consortium for Technology Transfer (FLC) award during a ceremony at the FLC national meeting scheduled to be held in Pittsburgh, Pa., on Thursday, May 3, 2012. WASHINGTON -- NASA has released a new educational game with an air traffic control theme for Apple iPhone and iPad devices. The Sector 33 application is designed to challenge students in middle school and above to use basic math and problem-solving skills. The application may be downloaded free of charge at http://www.nasa.gov/sector33. For more information about aeronautics research at NASA, visit http://www.aeronautics.nasa.gov. 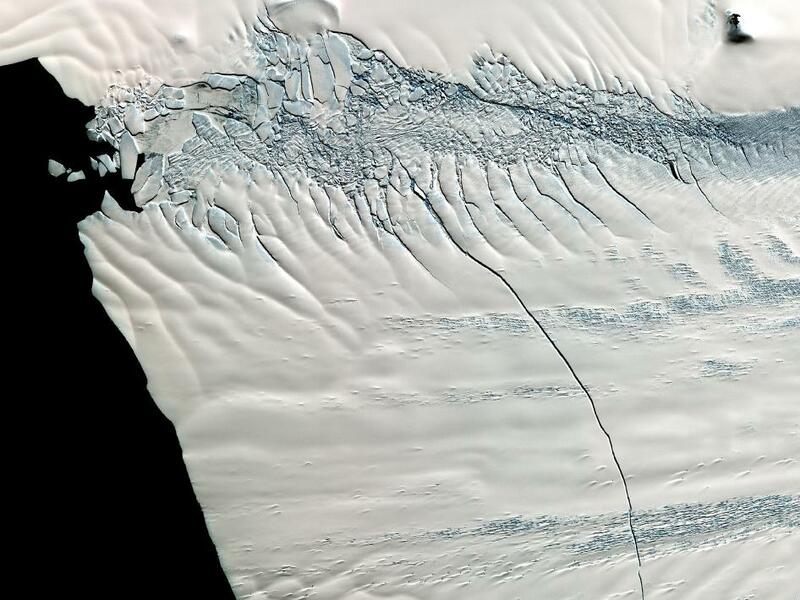 In mid-October 2011, NASA scientists working in Antarctica discovered a massive crack across the Pine Island Glacier, a major ice stream that drains the West Antarctic Ice Sheet. Extending for 19 miles (30 kilometers), the crack was 260 feet (80 meters) wide and 195 feet (60 meters) deep. Eventually, the crack will extend all the way across the glacier, and calve a giant iceberg that will cover about 350 square miles (900 square kilometers). This image from the Advanced Spaceborne Thermal Emission and Reflection Radiometer (ASTER) instrument on NAS's Terra spacecraft was acquired Nov. 13, 2011, and covers an area of 27 by 32 miles (44 by 52 kilometers), and is located near 74.9 degrees south latitude, 101.1 degrees west longitude. "Cellulose in the biosphere can last for years," said Gregg Beckham, a scientist in the National Bioenergy Center at the U.S. Department of Energy's National Renewable Energy Laboratory (NREL). "It's really tough, and we want to know why at the molecular scale." Unfortunately, these particular enzymes don't work fast enough to break down cellulose at a pace (and price) that is competitive with fossil fuels … yet. So, computational scientists at NREL set about trying to understand and create enhanced, "designer" enzymes to speed up biofuel production and lower the cost of biomass-derived fuel to serve the global population. 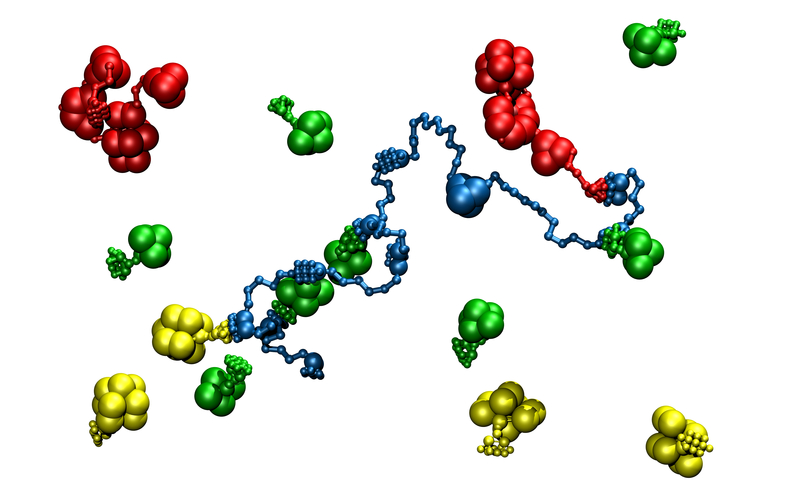 In a series of linked projects, researchers used the National Science Foundation-supported Ranger supercomputer at the Texas Advanced Computing Center and Energy Laboratory's Red Mesa system to simulate the world of enzymes. The researchers explored enzymes from the prodigiously plant-digesting fungus Trichoderma reesei and the cellulose-eating bacteria Clostridium thermocellum. Both of these organisms are effective at converting biomass to energy, though they use different strategies. "Nature cleverly designed machinery for single-cell organisms to locate cellulose, then secrete large enzyme complexes that hold the cells near biomass while the enzymes degrade it," Beckham said. The bacteria forms scaffolds for its enzymes, which work together to break apart the plant. The fungal enzymes, on the other hand, are not tethered to a large complex, but act independently. It isn't clear how the enzyme scaffolds form, so the researchers created a computational model of the active molecules and set them into motion in a virtual environment. Contrary to expectations, the larger, slower-moving enzymes lingered near the scaffold longer, allowing them to bind to the frame more frequently; the smaller ones moved faster and more freely through the solution, but bound less often. The results of the study, led by NREL researchers Yannick Bomble and Mike Crowley, were reported in the Journal of Biological Chemistry in February 2011. The insights are being used in the creation of designer enzymes to make biomass conversion faster, more efficient and less expensive. 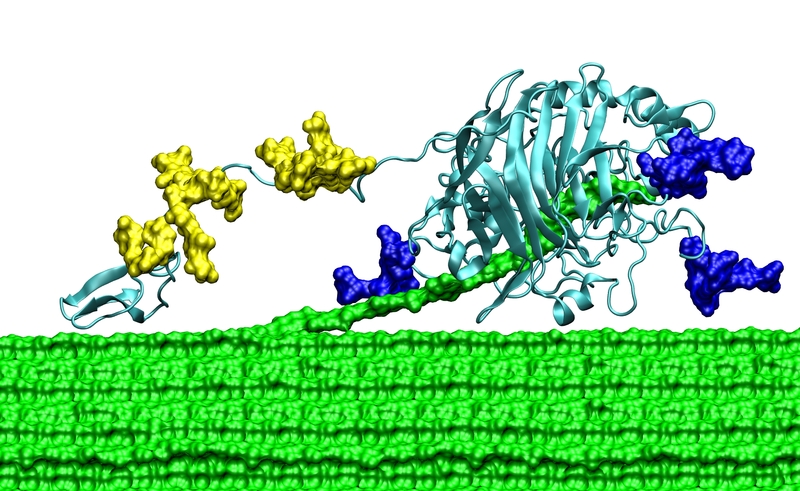 The scientists also studied parts of the enzyme called the carbohydrate binding molecule--a sticky "foot" that helps the enzymes find and guide the cellulose into their active site--and the linker region, which joins the foot to the main body of the enzyme. The carbohydrate binding molecule and linker region were long thought to play a minor role in enzyme function; yet without them, the enzyme can't convert cellulose to glucose effectively. The researchers wondered why that is. Using the Ranger supercomputer, the researchers made several important discoveries. First, they found that the cellulose surface has energy wells that are set 1 nanometer apart, a perfect fit for the binding module. They also found that the linker region, previously believed to contain both stiff and flexible regions, behaves more like a highly flexible tether. Those insights would have been difficult to determine experimentally, but, now hypothesized and backed up with advanced computing simulations, they can be tested in the laboratory. "It's a very messy problem for the experimentalists," said Crowley, a principal scientist at the Energy Laboratory and Beckham's colleague. "We're using rational design to understand how the enzyme works, and then to predict the best place to change something and test it." The research addresses the enzymatic activity bottlenecks that prevent renewable energy from cellulose containing biomass from being competitive with fossil fuels. "If we can help industry understand and improve these processes for renewable fuel production, we'll be able to offset a significant fraction of fossil fuel use in the long term," Beckham said. The National Science Board (NSB) will meet on February 2 and 3, 2012, to address science and engineering, as well as science, technology, engineering and mathematics (STEM) education issues of interest to the National Science Foundation (NSF). The meeting will be webcast as well. Members of the media and the public are invited to open portions of the meeting. Please go to the NSB website for the webcast link and full agenda. Some of the scheduled meeting highlights are listed below. The NSB will discuss NSF's Annual Facilities Plan. The NSB will discuss the status of CPP's Program Portfolio Planning. The NSB will receive information on the Atacama Large Millimeter Array (ALMA). There will be a discussion of NSF's Facilities Plan and the upcoming May Portfolio Review. There will be a discussion of the U.S. Antarctic Program Blue Ribbon Panel Review and the report from the National Academy of Sciences/National Research Council Study on Future Research Opportunities in Antarctica. The Task Force will discuss public comments on its report Digital Research Data Sharing and Management and future work of the Task Force. The Subcommittee will discuss Effective K-12 STEM Education and Research in Mathematics Education. CSB will have a presentation on NSF's Merit Review Working Group, receive an update from NSF on Cost Sharing, and discuss strategic planning. The Committee will discuss the rollout of Indicators 2012, the status of Indicators companions, and the Inventory of Government Programs: Trade, Export and Competitiveness. Visit the National Science Board's website for the full meeting agenda. The NSB is the 25-member policymaking body for NSF and advisory body to the president and Congress on science and engineering issues. Drawn from industry and universities, and representing a variety of science and engineering disciplines and geographic areas, NSB members are selected for their eminence in research, education or public service, and records of distinguished service. NSB members are appointed for six-year terms. The NSF director is an ex officio member of the NSB. Learn more about the NSB and its current composition on the NSB website. Note: Reporters are invited to attend all open sessions, subject to provisions of the Government in the Sunshine Act. All sessions will be held at the NSF headquarters, 4201 Wilson Boulevard, Arlington, Va. 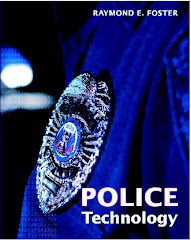 Journalists interested in attending and covering the meeting and/or interviewing NSF or NSB officials should contact Dana Topousis at 703-292-7750 or dtopousi@nsf.gov by 1:00 p.m. on Wednesday, February 1, 2012, to make arrangements. Asymmetric division of a polarized artificial cell results in daughter cells that differ in membrane and interior compositions. In this, the final panel, one of the daughter cells has polarized. Scale bar indicates 10 microns. Asymmetric division of a polarized artificial cell results in daughter cells that differ in their membrane and interior compositions. Scale bar indicates 10 microns. NASA Administrator Charles Bolden played host to 45 Brazilian Youth Ambassadors on Friday, Jan. 27, in the NASA Headquarters auditorium, where he delivered an educational outreach presentation. The Brazilians are participating in a three-week U.S. Department of State youth exchange program for outstanding Brazilian public school students. The Department of State requested this special presentation for the Brazilian students as a follow on to the Administrator’s successful outreach activities during his trip to Brazil in October 2011. 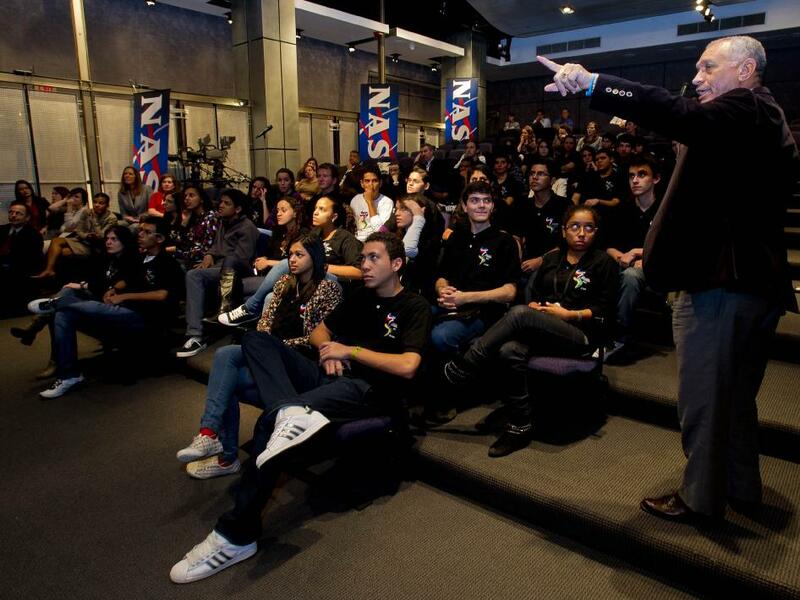 His presentation to students at the National Institute of Space Research facilities in São José dos Campos was simulcast by the U.S. Embassy and viewed by nearly 3,000 people throughout the country. The Youth Ambassadors are young people in pursuit of academic and professional success who make a difference in their communities through their leadership and volunteer work. As ambassadors, the students also have an opportunity to fulfill a very important mission - to introduce a little bit of Brazil to the United States. Since 2002, the program has benefited some 250 young Brazilians. The Youth Ambassadors Program has now expanded to more than 20 countries in the Western Hemisphere. During the students first week in the United States, Youth Ambassadors visited Washington, D.C. and took part in meetings with government officials, visiting schools and social projects. The young Brazilians strengthened their leadership skills through workshops and lectures during these visits. They then traveled to host states, where they stayed with volunteer families. They attended classes at local schools, took part in volunteer activities, gave presentations about Brazil, and interacted with the community. The program offered a unique opportunity to learn about the U.S. culture and practice English. After their return home, the students will implement community service projects they developed during their exchange program. WASHINGTON -- NASA has launched its first multi-player online game to test players' knowledge of the space program. Who was the first American to walk in space? Who launched the first liquid-fueled rocket? These are only a few of the questions players can answer in Space Race Blastoff. Available on Facebook, Space Race Blastoff tests players' knowledge of NASA history, technology, science and pop culture. Players who correctly answer questions earn virtual badges depicting NASA astronauts, spacecraft and celestial objects. Players also earn points they can use to obtain additional badges to complete sets and earn premium badges. "Space Race Blastoff opens NASA's history and research to a wide new audience of people accustomed to using social media," said David Weaver, NASA's associate administrator for communications. "Space experts and novices will learn new things about how exploration continues to impact our world." NASA chose to make the game available through Facebook to take advantage of the social media site's large audience and enable players to compete against others. Individuals also can play solo games. Once in the game, players choose an avatar and answer 10 multiple-choice questions. Each correct answer earns 100 points, with a 20-point bonus to the player who answers first. The winner advances to the bonus round to answer one additional question for more points. Space Race Blastoff was developed by Scott Hanger, Todd Powell and Jamie Noguchi of NASA's Internet Services Group in the Office of Communications. Play the game now at http://apps.facebook.com/spacerace. Imagine if there were electronics able to prevent epileptic seizures before they happen. Or electronics that could be placed on the surface of a beating heart to monitor its functions. The problem is that such devices are a tough fit. Body tissue is soft and pliable while conventional circuits can be hard and brittle--at least until now. "We're trying to bridge that gap, from silicon, wafer-based electronics to biological, 'tissue-like' electronics, to really blur the distinction between electronics and the body," says materials scientist John Rogers at the University of Illinois Urbana-Champaign. With support from the National Science Foundation (NSF), he's developing elastic electronics. The innovation builds upon years of collaboration between Rogers and Northwestern University engineer Yonggang Huang, who had earlier partnered with Rogers to develop flexible electronics for hemispherical camera sensors and other devices that conform to complex shapes. This is circuitry with a real twist that's able to monitor and deliver electrical impulses into living tissue. Elastic electronics are made of tiny, wavy silicon structures containing circuits that are thinner than a human hair, and bend and stretch with the body. "As the skin moves and deforms, the circuit can follow those deformations in a completely noninvasive way," says Rogers. He hopes elastic electronics will open a door to a whole range of what he calls "bio-integrated" medical devices. One example is what Rogers calls, an "electronic sock"--in this case, elastic electronics are wrapped around a model of a rabbit heart like a stocking. "It's designed to accommodate the motion of the heart but at the same time keep active electronics into contact with the tissue," explains Rogers. The device might detect differences in brainwave activity that occur just before a seizure sets in, and could automatically counteract any electrical abnormalities. Prototypes of the circuits are being tested that can detect muscle movement, heart activity and brain waves just by being placed on the surface of the skin like temporary tattoos. The prototypes can detect the body's electrical activity nearly as well as conventional, rigid electrode devices in use currently. Rogers says their size could offer benefits in many important cases, such as monitoring the health and wellness of premature babies. "They are such tiny humans that this epidermal form of electronics could really be valuable in the monitoring of these babies in a manner that is completely noninvasive and mechanically 'invisible'," he points out. BOSTON—A Fitchburg man was sentenced to prison today for his role in five bank robberies across Central Massachusetts. The case against Keith D. Cormier was made with the assistance of GPS technology. U.S. District Judge F. Dennis Saylor, IV sentenced Cormier to 56 months in prison to be followed by three years of supervised release. Cormier, 45, was also ordered to pay restitution in the amount of $11,485, the money which he stole from the banks. In September 2011, Cormier pleaded guilty to committing five bank robberies; between October and June 2010, Cormier robbed banks in Shrewsbury, Leominster (two), Worcester, and Gardner. In each case, Cormier entered the bank wearing a disguise, with his face wrapped in gauze, and passed the teller a note demanding money. He retrieved the note and fled the bank with the proceeds of the robbery. The most compelling evidence against Cormier was derived from two separate GPS devices. One GPS device was installed by his employer in the company truck which Cormier drove to and from the robberies. The data from the GPS device indicated that Cormier’s work truck was within blocks of each of the banks at the time of the robbery and departed the area within minutes after Cormier fled the banks. The second GPS device was secreted in a stack of bills by an alert teller during the robbery of a Citizen’s Bank on Oct. 28, 2010. This GPS device resulted in the police tracking Cormier’s van and arresting him a short distance away from the bank, with the proceeds from the robbery and his disguise inside the truck. United States Attorney Carmen M. Ortiz and Richard DesLauriers, Special Agent in Charge of the Federal Bureau of Investigation, Boston Field Division, made the announcement today. The case was investigated by the Federal Bureau of Investigation, as well as detectives from the Shrewsbury, Leominster, Worcester, and Gardner Police Departments. It was prosecuted by Assistant U.S. Attorney Cory Flashner of Ortiz’s Worcester Branch Office. In December, I had the opportunity to visit Fort Campbell, Ky., to learn more about their Military Functional Assessment Program. Maj. Sarah Goldman, Army Office of the Surgeon General, traumatic brain injury (TBI) program manager, and I were invited to see this comprehensive, advanced five-day assessment, which is part of a 12-week program designed to treat service members with TBIs. This evaluation does not rely on a pen and paper test or a computer assessment. It takes place on post and in the program’s simulation lab, exposing service members to realistic combat scenarios while allowing a team of medical and rehabilitation providers the opportunity to evaluate their responses. Service members are observed on camera while combat-related decision-making functions are tested, such as how long it takes a service member to come to the aid of a fallen comrade, identify a threat, plan a course of action, or radio call into a command center. If they perform tasks in simulated combat situations in accordance to Army standards, then this information helps guide return-to-duty decision-making. Additionally, the lab tests how the service member performs under environmental stressors, such as lack of light or loud sounds, to approximate scenarios encountered in combat zones. One of the program’s best practices relates to integrating the expertise of a non-commissioned officer (NCO) to evaluate the ability of the soldier to perform the tasks to established Army standards. In the assessment we saw, the NCO was instrumental in educating medical providers about Army standards and describing combat scenarios. Leveraging the knowledge of a qualified NCO helps the medical provider offer a comprehensive evaluation of the service member’s impairments associated with TBI and the injury’s effects on their ability to perform military duties on the battlefield to standard. In continuing to follow this advanced program, I hope that we can identify key outcomes that predict return-to-duty success, or help service members return back home. 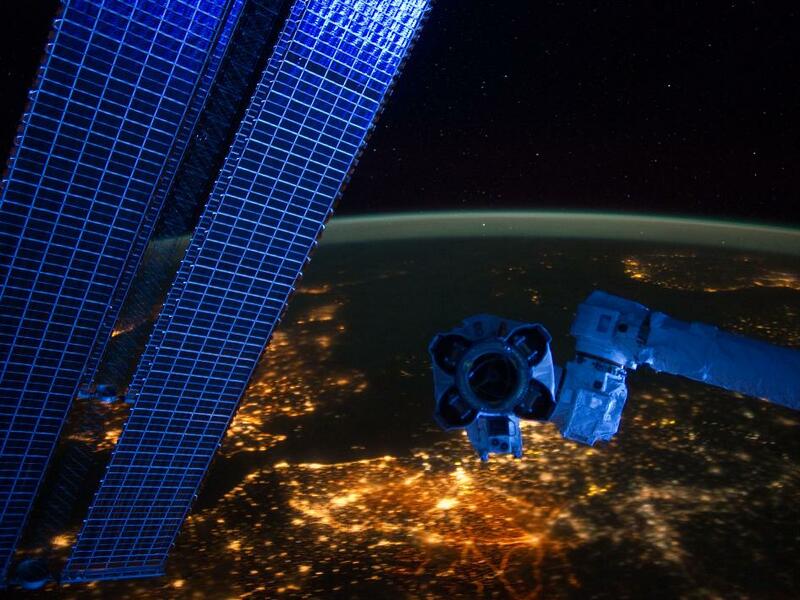 With hardware from the Earth-orbiting International Space Station appearing in the near foreground, a night time European panorama reveals city lights from Belgium and the Netherlands at bottom center. the British Isles partially obscured by solar array panels at left, the North Sea at left center, and Scandinavia at right center beneath the end effector of the Space Station Remote Manipulator System or Canadarm2. This image was taken by the station crew on Jan. 22, 2012. Climate change is on your porch and in your backyard and living room--anywhere you bedeck with flowering plants. Global warming affects favorite flowers of garden and vase. This is true of plants around the world, including the proteas and the pelargoniums native to South Africa. Pelargoniums are wild ancestors of common geraniums. Proteas, with their vase-shaped bracts surrounding pencil-thin flowers, look like brightly-colored sea anemones. During the Northern Hemisphere's winter, summer comes to South Africa and proteas and pelargoniums bloom in riotous color. On steep, rocky slopes, their red and pink flowers dot the hillsides. 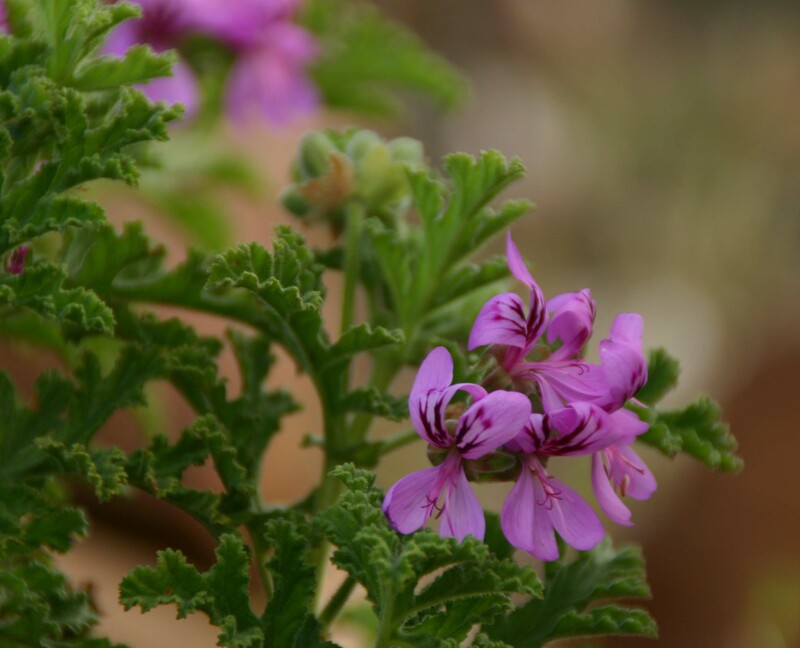 "As one of the most diverse plant groups in South Africa, the pelargoniums have a variety well beyond what's available at even the largest U.S. nursery," says Carl Schlichting, an ecologist and evolutionary biologist at the University of Connecticut who specializes in these flowering plants. But pelargoniums and proteas such as the king protea, which measures 12 inches across and is the national flower of South Africa, are under fire. Some will become extinct. Some already have. In a region where average temperatures have significantly warmed over the past 30 years, South Africa's--if not the world's--most unusual flowers are besieged. In response, they're moving uphill to cooler or wetter spots. When will they run out of room? No one knows for sure. But time is of the essence in learning about this ecosystem, says Schlichting. Despite centuries of discovery, most of the planet's biodiversity remains unknown. The scale of that unrecognized biodiversity is a vital question, scientists believe, given its rapid and permanent loss around the globe. To respond to the need for more knowledge and a better understanding of Earth's biodiversity, the National Science Foundation (NSF) recently awarded 25 grants in its Dimensions of Biodiversity campaign. The effort is part of NSF's Science, Engineering and Education for Sustainability (SEES) initiative. Schlichting and colleagues comprise one of the research teams funded. "By establishing networks of interdisciplinary, globally-engaged scientists, Dimensions of Biodiversity will have a lasting effect on biodiversity science," says John Wingfield, NSF assistant director for Biological Sciences. "It has the potential to transform the way we conduct biological research in this arena." The Dimensions of Biodiversity campaign is important, believes Wingfield, because assessing the living diversity of Earth is not as straightforward as simply listing species. The campaign is transforming how the role and scope of life on Earth is described and understood, he says. It promotes novel, integrated approaches to identifying and comprehending the evolutionary and ecological significance of biodiversity in today's changing environment and in the geologic past. "Dimensions of Biodiversity is accelerating the pace of biodiversity research and discovery, and it enables scientists to think at grand scales," says Joann Roskoski, NSF deputy assistant director for Biological Sciences. "Collaborative teams have formed to tackle some of the big questions using novel and integrative techniques," she says. "Taxonomists are talking to geneticists; geneticists to ecologists; and ecologists to taxonomists. This is not business as usual." With the loss of Earth's biodiversity, biologists have found, links in the web of life that provide ecosystem services are being lost; an understanding of the history and future of the living world is being forfeited; and beneficial discoveries in the domains of food, fiber, fuel, pharmaceuticals and bio-inspired innovation are being eliminated. That reality has stimulated the NSF awards, co-funded by NSF's Directorates for Biological Sciences and Geosciences. "Dimensions may accomplish in 10 years what, with a piecemeal approach, would have taken 50 years--a half-century we can no longer wait," says Roskoski. Proteas are the keystone species of South Africa's Cape Floral Kingdom, the smallest but, biologists say, the richest of Earth's six plant kingdoms. The Cape Floral Kingdom is the size of a postage stamp, comparatively speaking. It has the highest plant biodiversity, however, of anywhere on the planet. About 9,000 plant species, 70 percent of which live nowhere else, are found there in what's called the fynbos ecosystem. Just to the north lies another, yet more diverse, desert-like ecosystem, the succulent karoo. Near South Africa's Cape of Good Hope, leathery-leaved fynbos plants cover the mountains, valleys and coastal plains. Proteas and pelargoniums thrive despite nutrient-poor soils and high winds. Schlichting's research focuses on how proteas and pelargoniums have diversified over the last 15 million years during periods of climate change in southern Africa. "Contemporary climate change will drive responses at all levels of biodiversity, from the traits of individuals to distributions of species and biomes," says Schlichting. "Our team hopes to combine an understanding of past evolutionary patterns with an assessment of modern diversity to make predictions about the future of plant communities." Some pelargonium plants, for example, may be drought-avoiders, while others are drought-tolerators. Schlichting is discovering which ones are which. These traits may be linked with the environment, he and others have found, and may indicate patterns of local adaptation. "This study looks at one of the most diverse floras of the world," says Sam Scheiner, program director in NSF's Division of Environmental Biology, "and connects plant physiology with the evolutionary processes driving diversification. It is one of the most comprehensive views of this process, and promises to greatly expand our knowledge." As Earth's climate warms, species like proteas and pelargoniums will try to keep pace by adapting to new conditions or by moving to their preferred temperature and rainfall ranges. 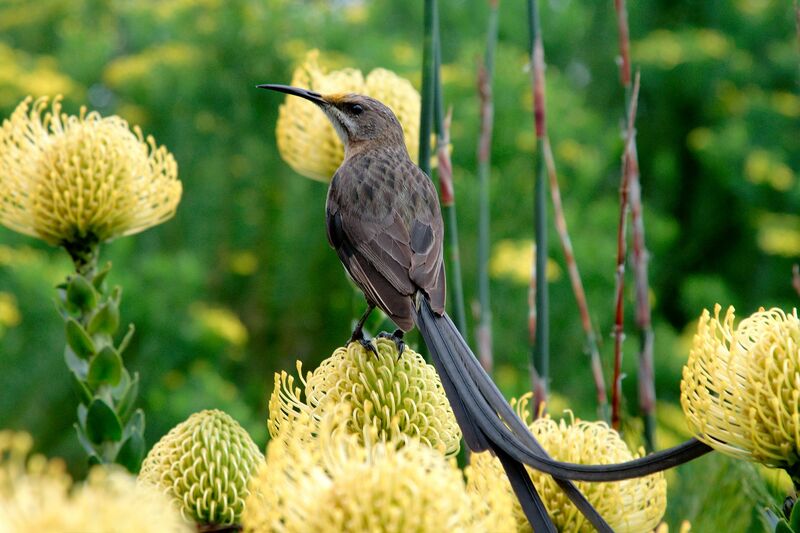 Protea seeds, for example, are carried on the wind to new locations. Those that become rooted in cooler or wetter areas will survive. "We may not have much time to understand why there is such a rich diversity of pelargoniums and proteas," says Cynthia Jones, a University of Connecticut scientist working on the project, "before they begin to disappear." From porches, backyards and living rooms. And from fynbos and succulent karoo. A simulated observation of a massive star viewed along the plane of the disk. This visualization of dust emission traces the density and temperature of the gas cloud that surrounds the star. The regions that are currently ionized (in red) and have been ionized in the past (blue structures) show how the nebula flickers. 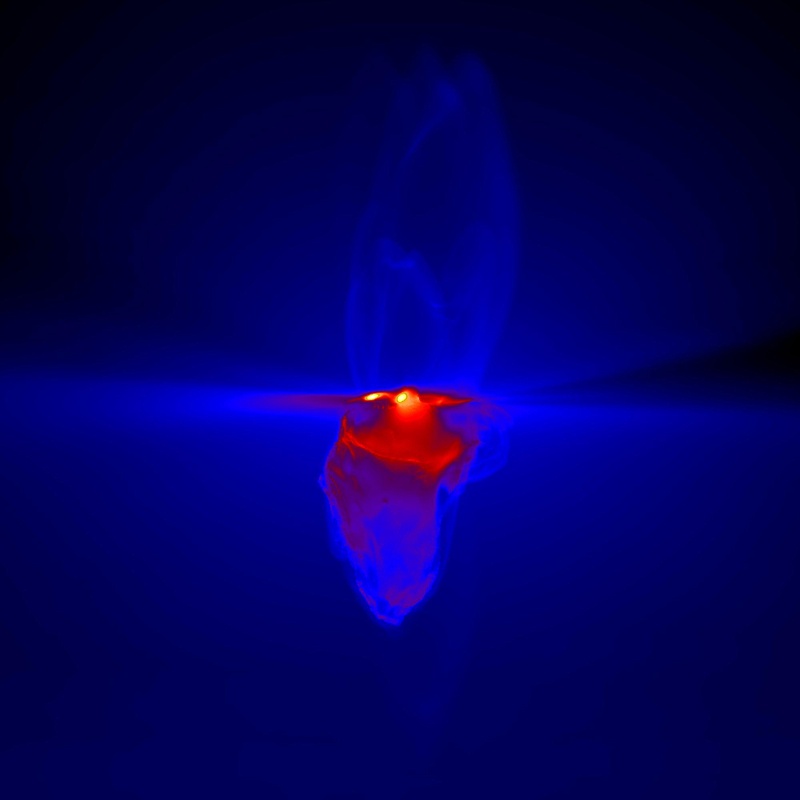 Simulations by researchers show that as the gas cloud collapses, it forms dense filamentary structures that absorb the star's radiation when it passes through them. Stars form when huge clouds of gas collapse. Once the central density and temperature are high enough, hydrogen begins to fuse into helium and the star begins to shine. The most massive stars, though, begin to shine while the clouds are still collapsing. Their ultraviolet light ionizes the surrounding gas, forming a nebula with a temperature of 10,000 degrees Celsius. This suggests that the growth of a massive star should taper off or even cease because the surrounding gas should be blown away by the heating. Credit: T. Peters et al. WASHINGTON – President Barack Obama traveled to Buckley Air Force Base near Denver today to praise the military for “doing its part” – not just in the nation’s defense, but also as leaders in energy conservation. Obama delivered his message at the home of the 460th Space Wing in Aurora, Colo., calling the “green” initiatives being advanced here indicative of the Defense Department’s clean-energy focus. The Air Force has installed a 1-megawatt solar array on the base, and last year test piloted jets there that run on advanced biofuels, demonstrating a key technology that reduces U.S. dependence on foreign oil. Obama noted that the Navy plans to buy enough clean energy to power 250,000 homes a year, through an effort that won’t cost taxpayers a dime. That commitment will grow the clean-energy market and ultimately strengthen U.S. energy security, he said. Obama recognized that DOD isn’t embracing clean energy simply because “it feels good,” but also because it makes economic sense. Alternatives to fossil fuels also are important to national security, the president told the crowd. “The less we depend on foreign oil, the more secure we become as a nation,” he said. The president noted Mabus’ point that the U.S. dependence on foreign fossil fuels creates a vulnerability that could affect its ability to operate its military ships, aircraft and vehicles. That’s why, Obama explained, the Navy in December made the government’s largest-ever purchase of biofuel. ”This summer, that fuel will power ships and subs during the world’s largest naval exercise,” he said, a reference to the biennial Rim of the Pacific exercise. Obama also noted that the Navy’s F/A-18 Green Hornet is powered by a 50/50 biofuel blend. And last year, the Air Force flew an A-10 Thunderbolt entirely on alternative fuels – a first for the military. “Overall, the Air Force is on track to save $500 million in fuel costs over the next five years because you guys have changed the way you operate. Think about that: half a billion dollars,” he told the audience, drawing big applause. Obama also expounded on the plan he introduced during his Jan. 24 State of the Union address to reduce America’s fuel dependency, make it more secure, improve the environment and create jobs. In addition to promoting more green programs in the military, it includes opening public lands for private clean-energy investments and providing tax incentives to the domestic clean-energy sector. As he delivered his message, the president praised the 460th Space Wing and other military members at Buckley and thanked them for their service. “During a decade of war, these folks — so many of you – exhibited the very best of America: courage, selflessness, teamwork,” he said. This article first appeared on Defense.gov. MOFFET FIELD, Calif. -- NASA's Kepler mission has discovered 11 new planetary systems hosting 26 confirmed planets. These discoveries nearly double the number of verified planets and triple the number of stars known to have more than one planet that transits, or passes in front of, the star. Such systems will help astronomers better understand how planets form. Planetary systems with TTVs can be verified without requiring extensive ground-based observations, accelerating confirmation of planet candidates. The TTV detection technique also increases Kepler's ability to confirm planetary systems around fainter and more distant stars. "These configurations help to amplify the gravitational interactions between the planets, similar to how my sons kick their legs on a swing at the right time to go higher," said Jason Steffen, the Brinson postdoctoral fellow at Fermilab Center for Particle Astrophysics in Batavia, Ill., and lead author of a paper confirming four of the systems. The properties of a star provide clues for planet detection. The decrease in the star's brightness and duration of a planet transit, combined with the properties of its host star, present a recognizable signature. When astronomers detect planet candidates that exhibit similar signatures around the same star, the likelihood of any of these planet candidates being a false positive is very low. Ames manages Kepler's ground system development, mission operations and science data analysis. NASA's Jet Propulsion Laboratory, Pasadena, Calif., managed the Kepler mission's development.